This no-fry eggplant parmigiana has all the deliciousness of classic eggplant parmesan but it’s way healthier. 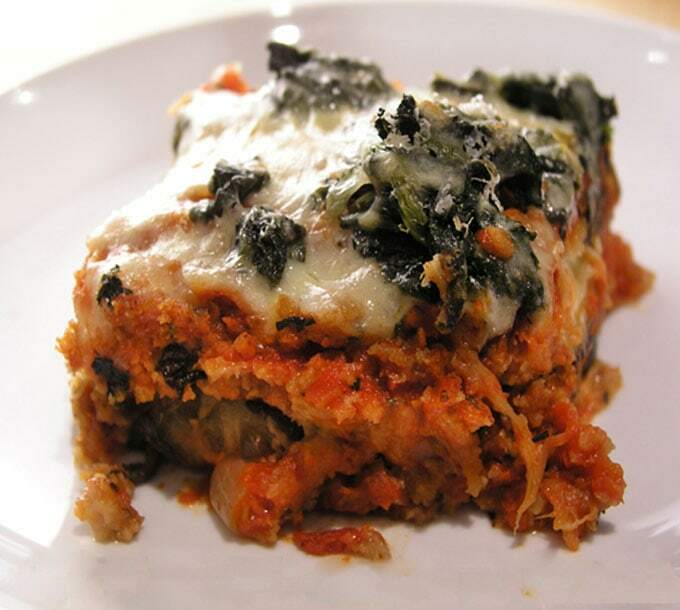 It’s made with baked (not fried) eggplant, and a generous topping of of spinach. This Italian-inspired no-fry eggplant parmigiana is tomatoey and cheesy and perfectly spiced with basil, garlic, oregano and thyme. Even better – the eggplant is baked – not fried – so it is light enough to enjoy a very large portion and go back for seconds (I did). The appeal of southern Italian food for me is a great tomato sauce. I use authentic San Marzano tomatoes for my sauces. They are grown in a particular region of southern Italy that has rich volcanic soil and produces, in my opinion, the absolute best tomatoes for sauce. These tomatoes are so prized that the Italian government had to create a seal of authenticity to protect the “San Marzano” name from impostors, who try to use the name to increase sales of their tomato sauce. The sauce in this eggplant parmigiana is thicker than average and works beautifully to hold everything together deliciously. 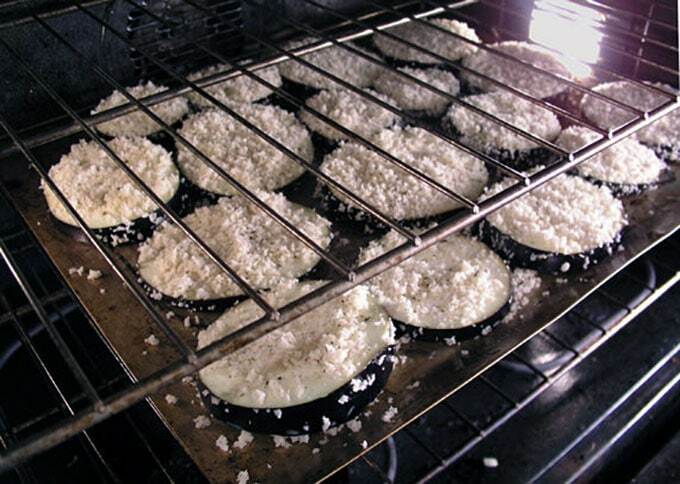 Eggplant slices are dipped in low-fat milk, lightly breaded, and baked. 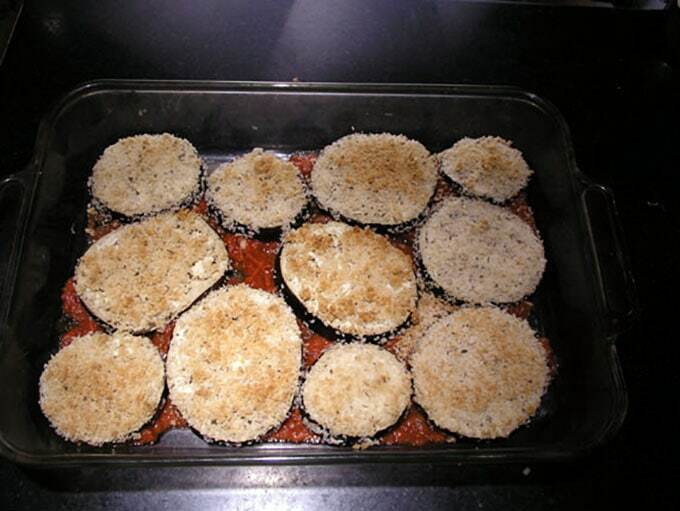 Once baked, the eggplant is layered with a rich thick tomato sauce and grated mozzarella cheese. 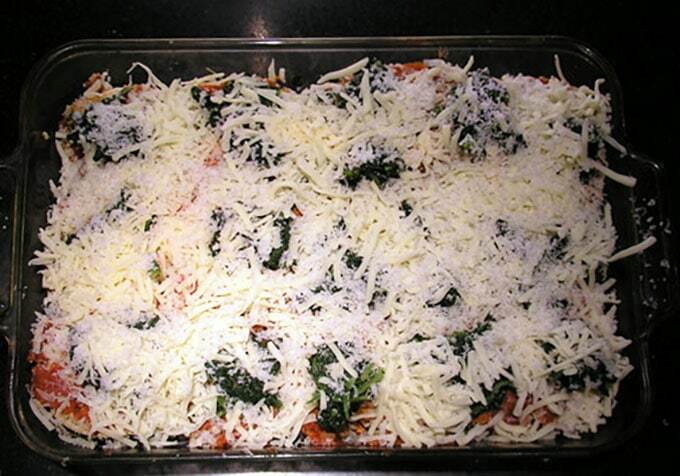 Chopped spinach is added to the top layer. The final cheese layer includes a generous sprinkling of Parmigiana Reggiano. Then into the oven for 40 minutes. It is worth noting where this recipe originated. I adapted it from a recipe in the famous vegetarian cookbook: The Moosewood cookbook, that was first published in 1977. It is an American Classic, listed by the New York Times as one of the top ten best-selling cookbooks of all times. I’m usually so busy exploring new cookbooks that I don’t think to revisit the old ones. This one is going back in my kitchen bookcase! 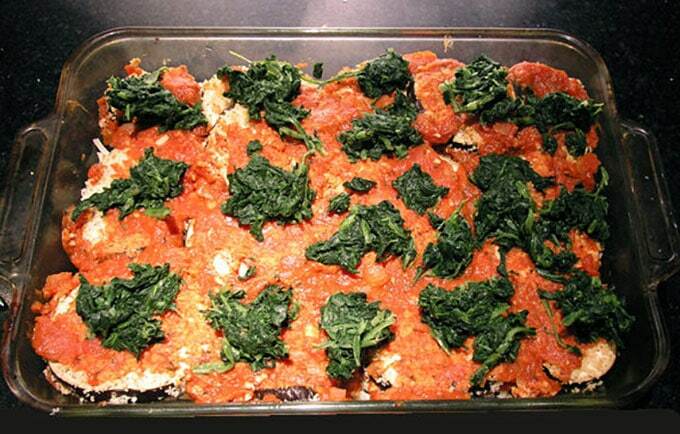 Here’s the recipe for No-Fry Eggplant Parmigiana. If you try this I hope you’ll come back to leave a rating and a comment. I’d love to know what you think! Make the Sauce While the eggplant is baking, heat oil in a large cooking pot or dutch oven oven medium heat. Add chopped onion and cook for about 8 minutes until very soft and starting to brown. Stir in dry spices and salt. Stir in crushed tomatoes, tomato paste and honey. Cook sauce at a simmer, partially covered, for 20 minutes. Add chopped garlic and simmer 10 minutes longer. Remove from heat. The sauce will be thick. Assemble the Casserole Ladle a thin layer of sauce into the bottom of a 9x14x2-inch glass baking dish or lasagna pan. 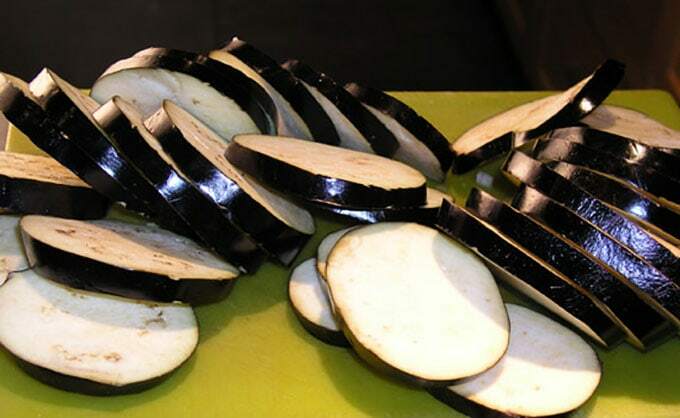 Then cover with a layer of eggplant. Then 1/3 of the mozzarella cheese. Add half of remaining sauce (because the sauce it thick, you might have to gently spread it with a knife, as if you are frosting a cake, to avoid smearing the cheese and crumbs around). Add the rest of the eggplant, then half of remaining mozzarella cheese, then the rest of the sauce. 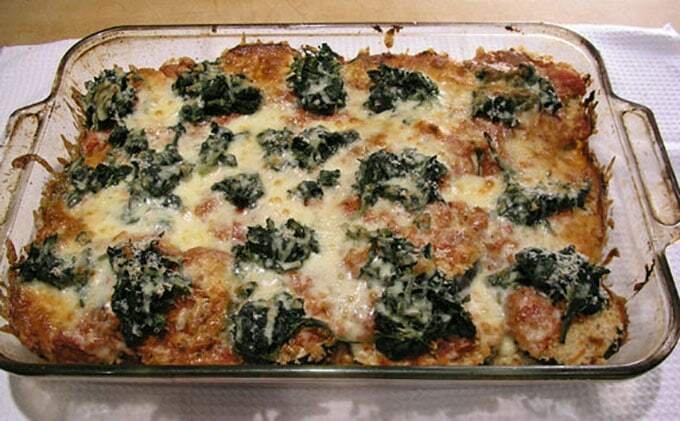 Place little piles of spinach, evenly spaced over the top of the casserole. Season with a little salt and pepper. Sprinkle the rest of the mozzarella and all of the Parmigiana Reggiano. Bake in the 375º F oven for 40 minutes until cheese is melted and starting to brown. Slice and serve and enjoy! Big hit with my guests! Definitely a keeper. I served meatballs on the side for carnivores. I love being able to prepare something long my before the guests arrive and bake it during appetizers. My apps were roasted cauliflower with muhammarra. Delish! Thanks, Lisa! I LOVE eggplant parmesan and have been craving it. I would never have thought to add spinach, but what a great idea! I’m going to try this version very soon! Great Carol! I hope you enjoy!! Loved that you included pictures! It made me feel confident that I had it right. Have you ever been to the Moosewood in Ithaca, NY? The Moosewood Collective created that cookbook you mentioned–and they have created others! That place is most delicious! Thanks for a great recipe–with pics! I’ve never been to The Moosewood Collective but I would love to go! I may be in that neighborhood soon visiting Ithaca college with my son and I will definitely check it out. Thanks Liz! This eggplant recipe was SO delicious! I love that the eggplant wasn’t fried. The photos and the cooking directions were so clear. Thank you Lisa for the obvious effort you put into your blog. Sooo yummy! I used basil olive oil to add a little extra flavor and did not have reggiano cheese so I used mozzarella/parm and some sharp cheddar–worked out just as well because of the sharp flavor. This is a fun cooking process, too…worth the time! Helped to have the pictures to follow- thanks for this awesome recipe. Another great eggplant dish, and no frying. Perfect. I cannot wait to make this this week. It look so delicious! Thanks Lisa. Lisa, I must say I was sure I’d found the most interesting blogs on line. and how recipes change with migration. Love your photographs as well. make this or any recipe from your blog, how it turned out for me! Just made this for 10 people — doubled the recipe and it worked out perfectly! Thank you!!!!! This is my new go to eggplant parm recipe. The kids loved it and I loved that it is baked not fried. Super flavor. Thanks Lisa! !